The evening was a truly special one and was the first of two sequential events to mark the end of the Merseyside Embroiders’ Guild 60th Year. The event was open to the public. We met at the splendid Capstone Theatre, which is part of Liverpool Hope University’s Creative Campus. The doors opened at 6 pm and the venue was buzzing from the time it opened. Our members’ work was beautifully displayed in the ground floor foyer. On the first floor, attendees could purchase books, fabrics and other items from the “Black Sheep Wools” stall. Coffee, tea and cakes were available. By 7 pm more than 200 attendees were all seated in the theatre. Expectations were high. We were welcomed by our Chair, Kim. Next our programme secretary, Marie, expressed our gratitude to the theatre for providing the venue and to Jan Egerton, Jason Jones and the staff at the University for their support and help. Textile designer, Brandon Mably, then gave an insightful and entertaining introduction to Kaffe. Kaffe began by giving a summary of his early life. He was originally from California and drawing was his passion from a very early age. His parent’s business provided opportunities for him to be surrounded by interesting people from all over the world, which gave him a desire to travel to exotic places. Kaffe first came to London as a young man and quickly decided that the UK was where he wanted to be. A trip to Scotland sparked his interest in wools. He purchased 20 different colours and then, on the return trip home, asked a woman on the train to teach him to knit. He showed one of his knitted creations to Vogue; they asked him to make something in a Fair Isle pattern. And this was the beginning of his meteoric rise within the artistic textile and stitchery world. During the presentation Kaffe showed how colour inspirations are all around us in every day surroundings and that we just have to look to see them. He illustrated this by showing pictures of vegetable plots, patterns in paving stones, houses marching up hills in Italy, shanty shops in India, buildings and much more. He then showed how these have influenced his creations. His presentation illustrated that, throughout his life, Kaffe has continued to evolve his art and to experiment with colour through various crafts including knitting and needlepoint, fabric design, quilting, upholstery, mosaic, wall paintings and wall paper design. He is not afraid to try different things and advocates working fast and being focussed. He is a prolific writer, publishing over 40 books to date and has worked with many cutting-edge companies such as Vogue and Heathcote & Ivory. His works have been displayed all over the world and he has appeared in numerous magazine, newspaper and book articles. Kaffe is an excellent motivational and uplifting speaker who has dedicated his life to taking traditional crafts and turning them into beautiful extraordinary works through the use of colour in novel ways. He is a world famous designer and a truly inspirational speaker. More information on Kaffe and his work can be found on his website http://www.kaffefassett.com/. Postscript from MK: I came home from this talk very excited and buzzing with thoughts … so much so that I could not sleep. 1 o’clock, 2 o’clock … I was looking forward to the next day, when I would be on the course given by Kaffe; I wanted to be fresh so I needed sleep. At the course, I discovered that quite a few other members had experienced the exact same effect from the talk. After the Friday evening talk at Capstone Theatre members and visitors arrived at the workshop with their heads buzzing and full of nervous excitement, wondering if they could produce work to match the wonderful images we had seen the night before. Kaffe and Brandon are two very enthusiastic artists and introduced the workshop by saying that the emphasis was on colour confidence building and to enjoy the dance of pattern. The first stage of the workshop was to cut bold, and I mean BOLD, hexagonals which were to set the palette for the quilt. With Black Sheep Wools fabric stall packed with fabrics the tutors helped participants to select fabrics if their own personal choice was not adventurous enough. This helpful shopping advice continued throughout the day. Kaffe also suggested swops with your neighbour if their fabric looked better on your quilt, which a few people did. This worked well when the hexagonals were on the design wall, which proved invaluable. Working with the design wall was a revelation to most participants and will be getting used in spare rooms all over Merseyside and the NW. Kaffe was strict in encouraging people to go their own way and not rely on others. He emphasised that we are all fabulous and although help was on hand for the less brave we all needed to be excited and inspired with our fabrics. The fabrics were fantastic ranging from charity shop finds, old shirts, Kaffe and Brandon designs and a few other designers added to the mix. We had some Zandra Rhodes and Amy Butler textile thrown in the mixing pot also. There was so much enthusiasm and a buzz in the room that we has to be told off a few times for talking and tittle tattle!!!! In the nicest way of course! Brandon and Kaffe were both great tutors and fears of working with such greats soon faded as they were both extremely helpful. Keeping colour confidence as a theme the hexagonals were outlined with star shapes with contrasting, nay even clashing, colours. No colour wheel principles allowed. In fact Brandon said if you don’t think blue goes with red, “get over it”. They wanted wonderful, delicious, wacky and a dance of colour. Did they get it?? Too right they did and in buckets full. The design walls at the end were a cacophony of colour. All so different but all stunning……. Here’s to seeing the finished articles…Upwards and Onwards…our new 2017 motto. Hanna Roberts, MEG’s first Bursary student (2013) gave a very detailed and informative talk about her life in stitching. She completed BA in Textiles at Manchester where she used the bursary to purchase materials, fabrics, threads and public transport for her degree work. Hanna expressed her gratitude to the Merseyside Embroiderers’ Guild for the opportunity. Hanna’s deep-rooted connections in the Welsh language, culture and communities as well as her love of Wales shone through her talk. Her first exhibition ‘Hireath’, ‘Longing’ in English and showed her personal letters handwritten in Welsh from her grandparents in Wales. We were able to see pictures of the exhibition and view the original embroideries which Hanna had brought with her. The words were digitally stitched, even the envelopes, but all looked as though they were on paper not material as the reverse of the stitching was hidden! Hanna was able to explore the history of embroidery at a variety of museums in the UK including the V & A, St Fagin’s near Cardiff and the Museum of Liverpool. She illustrated her talk with images showing the embroidered pockets from St Fagin’s museum that inspired her work and the groups of Welsh women stitchers she’d met whilst researching the social and cultural influence of stitching in 20th Century Wales. Hanna discussed her MA in Art & Design at Cardiff where she investigated how Welsh women artists express their identity. Hanna’s descriptions of the work of Welsh artist Eleri Mills were intriguing. They challenged the idea of traditional hand-stitching as Mills often works to dance music to get movement into to her work using giant stitches! Hanna is currently working with small groups in her old secondary school and aims to train as an Art and Design teacher where I’m sure she will be using her creativity to influence future generations of Welsh embroiderers in modern uses of traditional stitching. “Ashanti Inspiration,” was the title of the talk by Magi Relph and what an inspiration it was, with her amazing collection of fabric from the coast of West Africa, a real feast for the eyes! Magi’s depth of knowledge of the dyeing process, fabric construction, as well as the symbolism behind the designs, was well delivered, with the help of Sarah and Kim as they displayed the fabrics. It was amazing the depths of colour that could be created through the use of a mordant, river mud and bleach. The day was divided into two parts, the morning session was the talk, while the afternoon was a workshop. A number of ladies who had originally only intended to stay for the morning were so inspired; they cancelled their afternoon arrangements to enable them to take part in the practical activity. 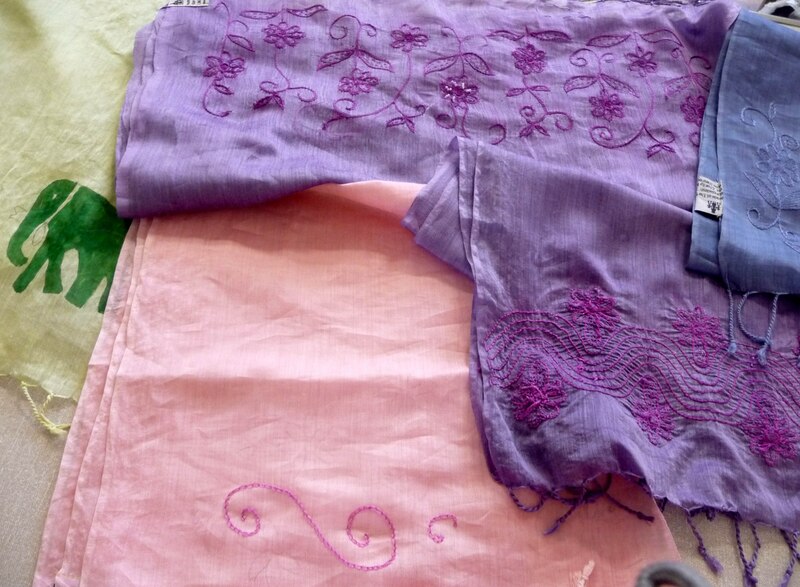 Everyone was provided with a piece of strip cloth, some of which had been hand dyed. Magi had brought examples of her own work and this was the catalyst for ideas; which resulted in book covers, purses, wall hangings and small bags. The variety of responses was truly impressive as creativity was unleashed through the simple use of fabrics, threads and beads. Another fabulous day with Richard Box. It was nice to see such good attendance, with members old and new and visitors as far afield as Alrincham . We started off with a pep talk on how we all had to watch, listen and pay attention. Does he think we are unruly!!! We cut lots and lots of small pieces of material, from the pack kindly supplied by Richard. Most of his finds are from charity shops and there was a really good collection of suitable colours. Including the dreaded blue crimplene. Attendees at talk will know the significance of that. Along with the materials we were given a supply of suitable threads to use for the finishing off. From these small pieces, which were stuck down with glue, one colour carefully positioned over another to get the desired effect. . We had to follow some rules to get the correct dirty grey tone required. (Hoover dust grey). Great fun was had as we played cut and paste. Then machine stitching, hand stitching and more machine work, to produce a Daisy masterpiece….. I wish…… mine is only a quarter finished. Watch this space. I think that Richard is a delightful man, and a great tutor and artist. We would all welcome him back again…… Drawing for the Terrified anyone?? Our evening was in the company of this charming and erudite speaker Richard Box, who took us to his start at Goldsmith College, where he was attracted to the possibilities of fabric. His talent with colour was evident in all the pieces of work he generously displayed round the room. Although originally trained in paint and drawing, he maintains he paints with his threads and draws with his sewing machine; both these activities using the same area of the brain. Complimentary colouring is important and we were given much detail of which colours were suitable with others. Machine and hand sewing stitches were used plus metal threads and beads. He was always prepared to learn how to use the various “feet” supplied with his machine. Richard proved he was a great material collector, favouring gowns from charity shops and bags of off-cuts, which he often took home to stroke! Richard admitted his approach to colour was greatly influenced by Impressionist artists. He also acknowledged Ruskin and Moore. He was a great fan of Betty Edwards “Drawing on the Right Side of the Brain” as a help for people actually seeing the world around them. Many years of teaching have honed Richard’s skills in explanation; careful observations are essential and an individual response will produce a unique result. Members attending the workshop will put all these points into operation, each starting from the same point but finishing with their own masterpiece! A group of MEG members and visitors were treated to a fascinating insight into life backstage at the Everyman Theatre. Such an iconic theatre, being a Grade 2 listed building which has recently been rebuilt. It was 10 years in the planning and won the award for the best new building in the UK (including beehives and bat boxes in the roof). Bricks were reused, about 16,000 from the previous build and some from properties redeveloped in Liverpool 8. There were 25,000 bricks used in all. It is a wonderful light and airy building making the most use of natural light as all the spaces are built on half levels. These include rehearsal rooms, dressing rooms, wardrobe department and a dedicated space for writers which is open to the public and houses many scripts. Our attention was drawn to the shutters on the front of the building. There are 106 cut with lasers depicting figures, and they can be seen from within the theatre. However they are really dramatic if viewed from the opposite side of the road. We were all interested to see the wardrobe space and the range of sewing machines and equipment. All costumes for in-house productions are made here, including wigs – very busy at pantomime time! The links with other theatres are many- the main one being with the Playhouse, as both theatres work with young people, John Moore’s university and L.I.P.A. There is a thriving Young Everyman/Playhouse group and a repertory company is in the process of being set up at the Everyman. There was a real buzz about the place and many of the spaces can be hired for private functions, funds welcome as the theatre is a registered charity. A thoroughly interesting and enjoyable visit. How lucky we are to have such a facility in Liverpool. Another wonderful meeting, we had two very special ladies sharing their work and inspirations with us. They were introduced as Chris and Catherine. Chris spoke first, she explained that as well as doing her own work she helped and encouraged primary school aged youngsters into the art of sewing, embellishing and many more skills. Chris had some of the children’s work with her and it was outstanding and lovely to see someone giving their time and patience to these projects, she must be very valued. They had created a school banner showing the plan of the school area, paths and trees all enhanced with materials. Four other banners were on display one for each school team and many more items. Next it was Catherine’s turn to speak. She told us a little of her life and how she came to be sewing- very interesting, then onto her work. Catherine had been much influenced by her frequent trips to South Africa visiting her brother. Materials and threads she had used were picked up along the travels. There were wall hangings all embellished, next she had a “bag phase”, varying shapes and sizes, cushions with images of African Art all so intricately finished, brooches and swatches of material that she had sewn then cut up and produced as cards. Before we finished Chris got up to show some of her personal work and how her love of gardening and nature influenced her. Also the love of her parents and the close relationship she had with them. Her last item was an amazing quilt dedicated to her mother with all her memorabilia sewn into it to keep and treasure. There was a gasp around the room as we clambered to see this. Thank you ladies for taking the time to visit us, we all had a most enjoyable day, one to remember. Yet another wonderful workshop day was enjoyed by all those who attended the Golden Hinde Or Nue gold work embroidery class .We were very fortunate to have two such skilled tutors,Sarah and her mum Sue. The class was well attended and we were a rowdy bunch to begin with but once Sarah started to demonstrate her technique on how to achieve the work she and her mum had produced, a hush fell upon the room, we were all intrigued . They had on display a wide variety of their work and ideas of how to embellish using Jap Gold . They gave everyone encouragement useful tips and plenty of patience . At the end of the session we were all able to achieve and produce our own piece of couched gold thread embroidery .Thank you again Sarah Rakestraw and Sue Hinde. We enjoyed an interesting talk and presentation by Rachael Howard who is a textile artist. Her work included sketches from an early age when she started sketching every day objects. After qualifying from the Royal Academy of Art she travelled to India and worked in an embroidery factory where she sketched the world around her. Here she was involved with stenciling, screen printing, applique, and hand and machine embroidery. All of these processes she used in her later works. On her return to England Rachael displayed all her Indian sketches and produced a series of wall hangings. She was commissioned by various companies to create designs which were incorporated into their products. These included duvet designs for Habitat, wall hangings, handkerchiefs and cushions. Rachael worked as a freelance textile artist for Paul Smith while producing many “quirky” neck ties. Recently she has been involved with teaching textiles to students of all ages. She showed us slides from her “Red Work” and recent “Blue work and “Mixed coloured work” which utilized her sketches and doodles. Rachael is currently working at the Royal Liverpool Hospital with stroke and dementia patients.Her talk was informative, entertaining and enjoyed by all. After seeing Gill’s beautifully made reticules at the Christmas tea party I thought that I would like to learn to make one. As I had never heard the work reticule before I investigated on the Internet: – “a reticule was a small drawstring bag carried as a purse by women in the 18th and early 19th century. It was also used as a name for any kind of purse or handbag carried by women at that time.” The dictionary definition of reticule is “a small purse or bag originally made of net but later of silk or rayon.” The word reticule comes from the Latin reticulum meaning a net or mesh bag. It entered the English language from the French reticule. The workshop was well attended and we all took our own fabrics of which there were a wide variety of colours, textures and patterns. Also, we took our own embellishments e.g. thread for embroidery, beads and motifs. We were given a colour-illustrated document which set out the instructions for making a reticule, very clearly. The bags could either be machine or hand-sewn, and facilities were available for ladies who took their own machines. Gill was on hand to help anyone who got stuck. At the end of the workshop some of the class had finished their reticules and others had at least half finished so that we had all learned how to make this lovely little bag. It was an enjoyable workshop with a relaxed atmosphere. All in all a day well spent. On a chilly January afternoon members enjoyed a talk by Bobby Britnall, a highly regarded UK textile artist with a background in theatre, music and an apprenticeship in tailoring on Saville Row. Bobby’s talk focused on ‘‘Hands up for Uganda’’, a charity set up in 2011 by Bobby and her husband. The charity aims to empower the people of Kisaabwa, a remote village in Southern Uganda, helping them to become self -supporting and providing a sustainable future for the village. Bobby explained that barkcloth is one of the oldest non woven materials and in 2005 was recognised by UNESCO as a fibre requiring protection. The bark is stripped carefully from the Matuba tree. This is highly skilled work and once stripped of bark the tree is protected by wrapping the trunk in banana leaves. The bark is steamed, beaten and rollered into cloth; a strip of bark of 18ft creating up to 2 metres of cloth. It is traditionally made into costume worn by the village chief/healer and, unlike bark cloth from other countries, is typically unadorned apart from some cowrie shells to trim the edges. Bobby’s inspiration in recent years has come from the beauty of the barkcloth and by Omweso, a local game played in the village based on small hollows carved into stones using seeds as dice. Bobby brought along several of her textile pieces, all inspired by Omweso, which were greatly admired by members. Bobby is currently working in collaboration with UK designers developing the further use of barkcloth (clothing, lampshades). A very enjoyable talk by a very talented artist.